The old club set is one of a slew of charming inclusions and upgrades, resting on a very solid and challenging swing engine whose learning curve now reaches for golf’s lifelong appeal: Easy to learn, difficult to master. It’s the best entry in a series I have grown to love despite playing zero golf in real life, and an excellent send-off for the title on this console generation. Tiger Woods PGA Tour 13 was a solid game but it struggled to justify itself over its predecessor in some key areas. A new swing system last year introduced some much-needed determinism and was a fundamental improvement, but other aspects, such as a deadly automatic caddy recommendation that you could deviate from (it was all or nothing in Tiger 12), stripped out a lot of the challenge it was meant to offer and shortened the long-term appeal of the game’s career mode. Now the game is properly supported by a shotmaking system that isn’t a crutch, while still being intuitive and approachable for someone who is more video gamer than golfer (or who may be a golfer new to the game.) You can hit it straight ahead every time and, with a steely short game, have a puncher’s chance on some tough holes. Case in point, No. 18 at Pebble Beach, a hole I have long abused with a caddy calling out perfect location and draw to stay left of the trees on my tee shot and then thread the needle between the long, shoreline bunker and the greenside trap on the second shot. Be prepared to shoot par if you’re just going to swing for the fences on auto-pilot. Moreover, your golfer now bears the workability attribute, not your clubs (though the amount of workability depends on shot type), and it affects how much play you have in your draw and fade. (A guy like Bubba Watson goes so far in both directions I thought it was a glitch.) It’s a shrewd balancing adjustment that forces you to pay attention to the control aspects of your game, rather than load up on power, accuracy and putting and dominate, even early in your career. Also, your attributes are now capped within the tiers of leveling up. This eliminates grinding out XP in other modes of play and dumping it on your rookie, making him Ben Hogan in his tour debut. You may import up to 50,000 XP from a golfer in a previous version of the game if you still have the gamesave. Tempo was another golfer attribute that, by improving it in the past, you could tighten the window of your mishit and make the swing engine a lot more forgiving (and, conversely, mishits a lot more random.) Now, mishits are entirely up to your actual swing tempo on the stick. Drawing back, waiting at the top of your backswing, checking a text message, making a sandwich, and then slamming it forward is going to give you a mishit, and there’s no way to rank up out of that. There is also the introduction of swing styles, but I consider this to be more of a cosmetic inclusion and a means to apply some attribute boosts in the background. Basically, you can determine if your golfer is a power hitter versus a control golfer, if he prefers draws to fades or vice versa, and if his trajectory is low, medium or high. That way Arnold Palmer is hitting white-knuckle, low trajectory shots up to the greens, rather than taking a generic best path to it. Ultimately, the genius of the game’s refined balance can be seen in its putting. As a relative latecomer to the series, trying to read a green by myself in this game gave me the vapors. Caddy recommendations were absolutely critical to my performances, and I had come to understand where in the circle I should place the arrow (typically in its southwest quadrant). Forty-four foot putts with laser accuracy is why sub-60 rounds, even on Tour Pro difficulty, were all too common, and you had to jack up the opponent scoring AI to get a real challenge on tour. Well, caddy recommendations are gone now (in a tour event anyway. You can get advice, now dispensed from a “PGA Pro,” but only in a practice round.) The putt preview, which had been the ultimate handholding cheat, now has greater utility and is a more authentic depiction of the act of reading a green in real life. With it enabled, you can use it once per shot. But when you line it up, you had better make as good a guess as you can, because after it shows the ball’s path, once you move the D-pad, it disappears. If you are wildly off—or because of the way the camera now works, if you’re lining up a very, very long putt, your adjusted aim now comes down to luck and a gut call. But if you have been paying attention at how your path lengthens with more speed, curves with less, and how much angle to put against those dots speeding down the slope, you can pull off some miracles. I drained a 35-footer on Oak Hill’s No. 6 after my tee shot went AWOL, and I really did jump out of my chair, throwing a fist. I played on Tour Pro difficulty with putt preview, and enabled zoom to target, but required myself to hold the right stick in place to strike the ball where I wanted, making sidehill lies (a new inclusion) more threatening. My HUD shows carry distance, not total distance of the shot, introducing some uncertainty to how I set up a shot. All of this is in a custom set of preferences and controls, and they all work to make this game what I have praised MLB The Show for the most: a sports simulation that legitimately challenges your strengths while giving you options to minimize your weaknesses as you learn from them. 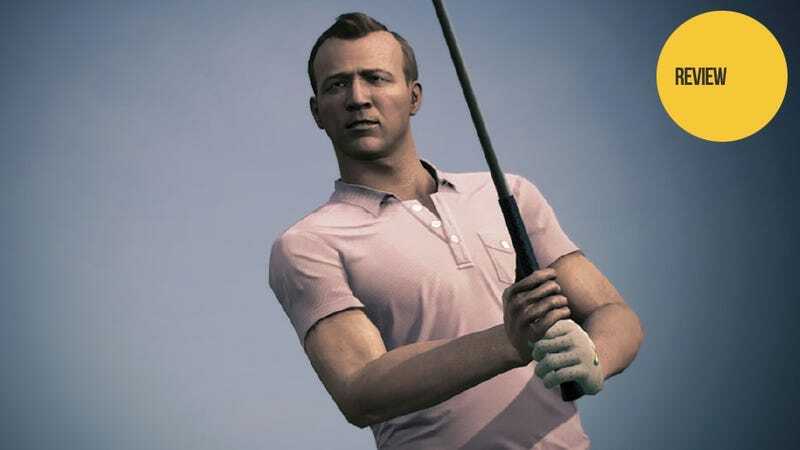 Tiger Woods PGA Tour 14 is recommendable on this merit alone, though it does pack in a ton of fan service, eye candy, and just plain neat features, like the Mashie, the Brassie and the Cleek. Those clubs are part of “Legends of the Majors,” which is a history lesson posing about 60 different minigame challenges in six golf eras (the early ones have replay graphics that will make you clap the first time you see them). The idea is to have fun playing in plus-fours and flat caps and, once you have completed an era and bested one of nine all-time greats, you unlock the golfers and the time period (represented largely by screen tone, golfer and gallery attire) for use on any course in the game. Playing as Arnold Palmer in the 1958 Masters, in which Amen Corner acquired its nickname, is indeed a real treat, but some of the events filling in between are hit-or-miss, entirely because of the limitations of licensing. Gene Sarazen’s match play triumph over Emmet French at the 1922 PGA Championship is indeed worth recreating, but not if it’s Rory McIlroy as Sarazen and Keegan Bradley as French. At least they are using the correct course: Oakmont Country Club. Jack Nicklaus stars in a replay of his 1977 British Open—at Royal Troon. The Duel in the Sun was staged at Turnberry, a course that has appeared in this series but whose license was likely not renewed last year. Discrepancies like that keep “Legends of the Majors” from being narratively compelling, but the amount of gameplay it serves, particularly as a pick-up-and-play experience, is commendable. Quick Tournaments is another jump-right-in feature that now gives you any event on the game’s tour series in its final round, with full event presentation, without having to grind through a career just to get your shot at a Green Jacket ceremony. You’ll play the round from a variety of scenarios supporting one to four players, from both (or all) players tied at the top after three rounds, to one player trying to come from outside the top 10 to win. All of the multi-golfer scenarios can be padded out with AI opponents. In sports, play-now modes are taking backseats as career and other modes beef up, and I’m pleased to see anything make that more relevant. Also, a word about the Masters Historic Edition. This is essentally $10 worth of extra content, which you can get at retail or add on later through DLC. Some may argue that a course like Augusta National in 1934 is a base-game essential for something so dedicated to history, I can say that splurging the extra $10 delivers a lot of value—the Augusta Par 3 and four more full courses. Augusta in 1934 is a real mindbending experience—the course was flopped: Hole No. 1 then is No. 10 today, and the original hole layouts are markedly different. (No. 16/7 has almost no water hazard). Its greatest drawback, however, is you always play the course in the sepia-tone newsreel footage. [Correction: You can unlock the course in full color in Legends of the Majors]. I would much prefer to see the course in modern daylight and color, especially as the washed out filter can make it tough to find the fairway when you’re lining up a drive. Still EA Sports didn't just skin the course; they also added some squawky, old-timey radio commentary if you play the Masters (then the Augusta National Invitation Tournament) on 1934 Augusta from Quick Tournaments. In present day, the commentary team of Jim Nantz and David Feherty have deepened their discussion of the 20-or-so real-world golfers in the game, but when it’s your created golfer lining up a shot, they still struggle to deliver any conversational consistency that makes it sound like you’re watching golf on a Sunday. It’s not as repetetive as past years, and it’s bolstered by new mid-round graphics that refer to your player’s performance in the last event, what’s coming up, how many birdies were made on the hole you’re now playing. You’ll get leaderboard updates between shots, too, but a few too many holes end with a graphic not relevant to the leaderboard (in some cases, a stat like eagles shot this round, which often is a string of zeroes). The crowd is also a little out of touch; driving the green on a par 3 still gets a burst of applause no matter where it lands. The game may be striving to use Nantz and Feherty better, but their call is still too reactive and clipped. Considering that most people play as themselves, and you need silence as you’re setting up your shot, I’m just not sure this is something a video game is equipped to deliver. If that’s the most intractable shortcoming of Tiger Woods PGA Tour, then the series has done very well indeed. I haven’t yet mentioned things like the inclusion of the LPGA Tour, neat diversions like night golf (except at Augusta) and variable start times, or even the fact that all four Majors are appearing together in a video game for the first time. That’s all four honkin’ Major tournaments, giving an enormous boost to the depth of the career mode. If you’re truly a masochist, play Simulation difficulty. Better yet, play it with Kinect. I’ll wear underpants on my head if someone can show me a score under 100, in the first week of release, under those conditions. Online, I was playing this game so early (I’m on vacation as I write this) that most of what I saw in online play came from its demo. I’ll revisit the game later to judge its new features, but EA Sports console titles have all been very sturdy on release day. You can now play in a tournament with up to 23 other players, all represented as shot arcs, so you’re not waiting your turn for everyone to shoot one-by-one. Obviously, I didn’t play in anything that robust pre-release, so I have no idea what that really looks like as you’re trying to line up your second shot to the green. The Tiger Woods PGA Tour team was noticeably stung by reactions to last year’s game, especially as it delivered a fundamental improvement to the swing engine. But some holdover features and design choices undercut the challenge it sought to deliver. Further, a total miscommunication on downloadable content, between press and publicity staff alike, portrayed the product as renting rounds to gamers when that wasn’t actually the case. The response has been exactly what you want to see out of developers of an iterative sports title coming off a misfire. There are more courses on the basic disc than every before. The swing’s value is even greater thanks to design changes elsewhere that highlight its determinism, and deliver the sense that you made a great shot, you didn’t just plug in coordinates. And the all-out delivery of longtime fan requests—I sat in their office and begged for playoffs last April, and they sucked it up and found a way—speaks to a game working to earn your dollar, where some of its more highly regarded peers have been playing out the string on this console generation. Tiger Woods PGA Tour 14 hits it on the screws. With a brassie.